I've not been posting as much as I'd like; I've been lax and I've been using bad puns involving chilis and biscuits. I hope you'll forgive me for those, it's the weather I tell you! The weather! The humidity turns my hair into something akin to an ajumma perm and seems to have a similar effect on my brain. While I love Korea, I am not enamoured with the disgustingly hot and moist summers that we suffer through each year. In the Ajosshi household we're getting a lot of use out of what I like to call the "poor man's air conditioner". 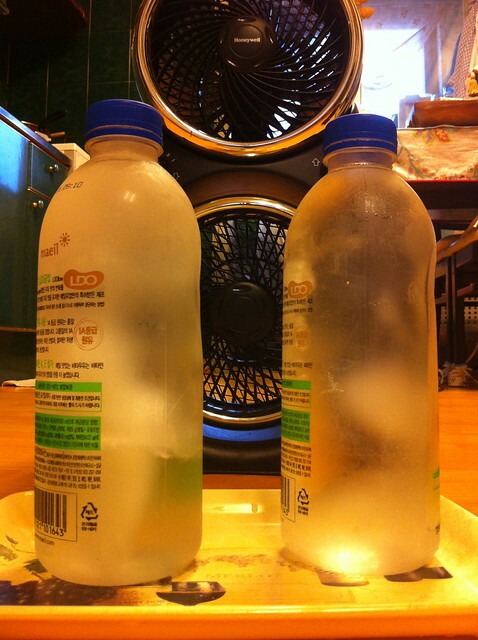 Combine an electric fan with a couple of frozen bottles of water and you may find yourself just that little bit cooler. I should point out that when using the fan we do keep all windows open and until now neither myself, my wife or the cockroaches that live in our villa have expired (fan death shall not claim us this summer, I tell you!). This is the bit where I do a happy dance in front of the computer. It still seems a tad unreal, but I've been tasked with writing a set of children's books over the next couple of months. Writing for kids is something I've wanted to do for a long time and I'm both surprised and ecstatic that I have the chance to fulfill one of my dreams. There's a lot of work to be done, but I'm looking forward to putting words on paper and having someone else illustrate my ideas. I'm as happy as the dog that ate the cat that got the cream. That's it for now. I've got to go and write a review of Transformers 3 for 10 Magazine that is imbued with my passionate hatred for what Michael Bay has done to children's toys and yet is still suitable for a general audience to read. P.S. The delightful Cynthia Yoo has just had her latest article posted on Yonhap. I make a brief appearance where I witter on about translation. Read it if you dare. Does Vegan Food Need More Love?